Watching Puchidols brings to mind one thing and this is nendroids. Nendroids is a type of collectible figurines that are character replicas stylized in a super deformed or a chibi manner. For Japanese fans this screams kawaii, and for fans of this show, there is the same fuzzy feeling. Puchidols or Puchim@s is a spinoff of the anime Idol Master, so watching this series requires at least some degree of characters knowledge to make this show more personable. 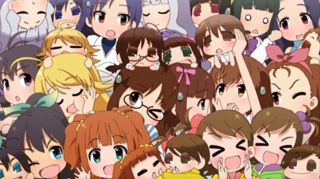 But not really, so if you're a new viewer to this show then by all means sink in these hilarious slice of life shorts where the Producer is a stylized 'P' caricature and there are plenty of cute female mini idols; each aptly representing their humanoid counterparts. 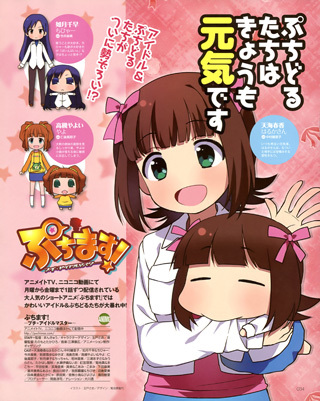 The anime, Puchim@s is adapted from its 4koma manga counterpart. 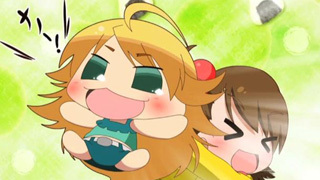 Chibi depictions of characters could be used as a product or advertising revenue, but in this series these kawaii character are adapted into the main storyline. These mini idols are used as focus characters that push the story or skit along. As the mini's puchidols are found and gathered by the humanoid characters, they are treated as pets. 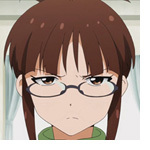 They are either much feared like Haruka's puchidol or loved like Makoto's counterpart. 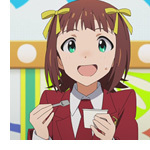 Names are given, and these puchidols are at times cared for, often not by their namesake characters, but by other 765 Pro idols. Many adventures do occur at 765 Pro's office, or at other outlandish places like Egypt or Brazil. 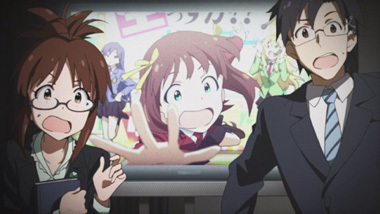 Popularity of a show is depends on entertainment value, and this show pulls the cute and funny cards well. Every episode of Puchim@s runs for around two bite-sized minutes, and can be marathon watched on Funimation.com. 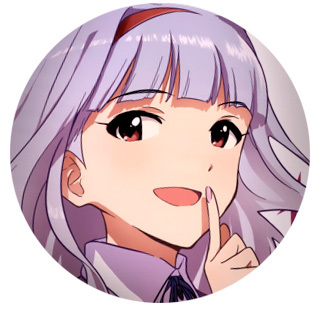 Video content is hosted by hulu.com, so technically there is a route of watching Puchim@s on hulu. Funimation has the license to simulcast this show, so they get dibs on airing it first for viewers to enjoy for free from Monday to Fridays, starting from January 2013. This has turned into a 40+ episode series, with no end currently in sight. With the shortness of the episodes, expect a joke to run on for a couple of days. 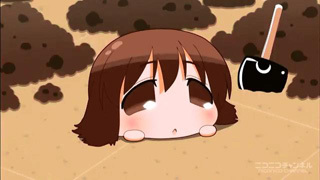 Also don't expect frequent all cast episodes featuring all Puchidols as there is too much cuteness to go around, expect to watch characters featured unexpectedly. 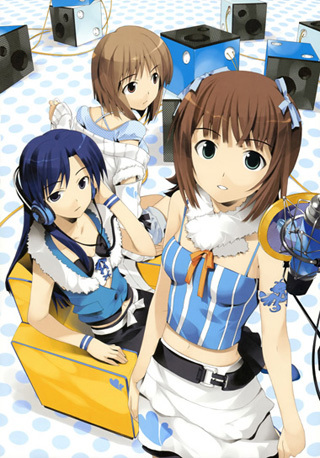 The ending theme shows the show's pattern of including only a few puchidol alongside their humanoid counterpart. 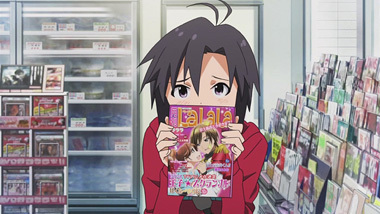 Other shows that can probably provide a similar watching experience is Adventures of Mini-Goddess, Hetalia or Poyopoyo all for varying yet similar elements that Puchim@s shares. Given an opportunity, would a person ever want to embark on the difficult road to fame? Millions would attempt and only a few can make it the top. Watching the success of reality shows like American Idol, there is no shortage of people who would want to an entertainer. In the United States there are a good number of star agencies that would train individuals to succeed in the world of entertainment. Now ask a teenager on other side of the world, and they'll probably mention being an idol or being part of a group as a solution to go on this fame route. In Japan, would-be-idols join up with an agency to develop and nurture their skills. But before getting into an unnecessary explanation of what an idol is, being a fan to an idol is not an easy job. Going after celebrities is akin to being a patronage of arts. Supporting their appearances, products, and projects means time and money. Standing at a concert is a long work out for the priceless experience of being near people you admire for their talents, looks, and style. 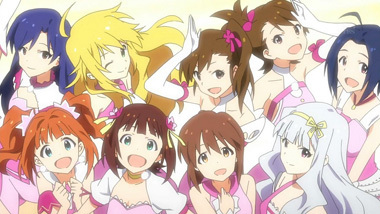 Consider the anime of Idol Master and experience stepping into a world of star making. 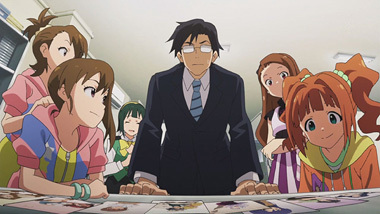 Idol Master is an anime about the idol agency 765 Productions and challenges the agency's 13 contracted workers have as they go on the road to being famous. 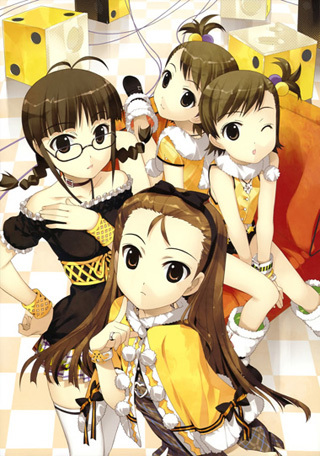 Idol Master was a video game before it was developed into the anime. 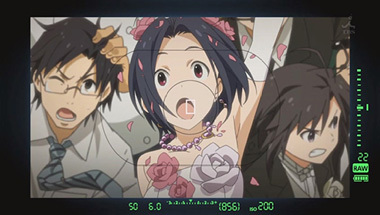 The anime is filled with characters and elements that are from a series of video games, released at different times. There are Xbox 360, PSP and DS versions. 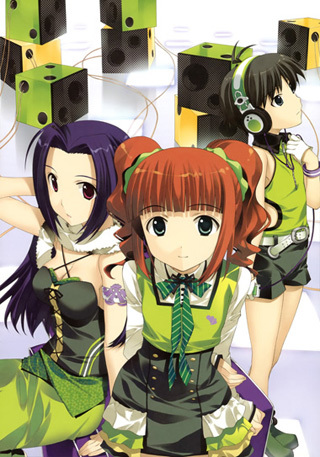 It is a rhythm game as well as a Sim game. These are all though, Japanese only released games. What a great variety for Japanese fans that have seen this title in game, drama albums, manga and OVA before seeing it as a full length anime? 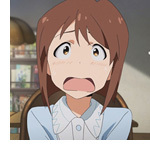 For viewers who get into this from the CrunchyRoll available 25 episode anime, be aware that there is plenty of music playing in the background that has already been released in albums before. 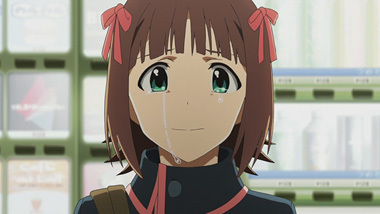 The music aspect is covered to the point that this anime has 25 different ending themes. The appeal of this series is to know that with every hardship, to value friendships and discover strengths or challenges within. 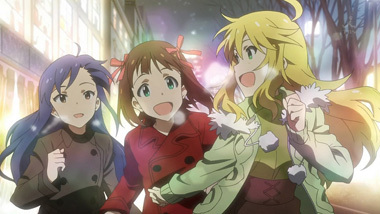 Idol Master is a slice of life story for those who want to experience other anime titles of a similar nature. For the idol group type of works, consider looking into Japanese AKB48, Love Live School Idol Project (another CrunchyRoll title), or another 1995 title of Idol Project. 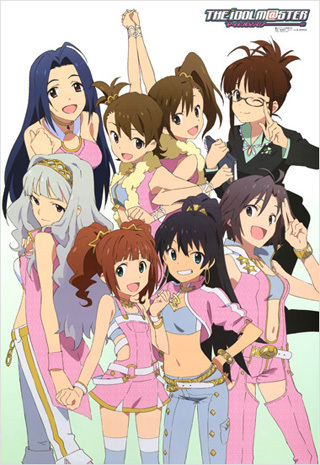 Fall for the idols of 765 Pro as much as I have enjoyed watching this title. 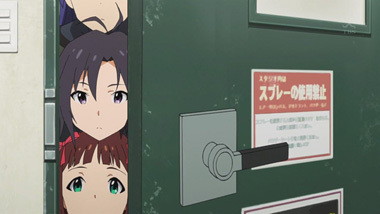 Below: Scenes from The Idolm@ster. 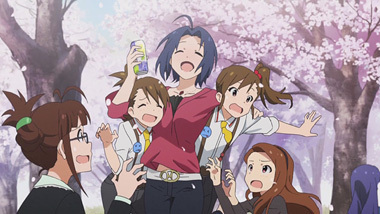 Below: Scenes and promotional artwok for PUCHIM@S.
Below: Promotional illustrations for The Idolm@ster.